The family of the deceased Kuno Takeshi, researcher emeritus of the Institute who passed away in July 2007 at the age of 87, expressed their wish to contribute photographic materials and field notes from his research. These were transported to the Institute on November 7. 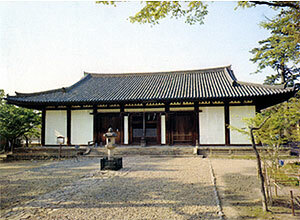 Kuno studied the history of Japanese sculpture and conducted active field studies. 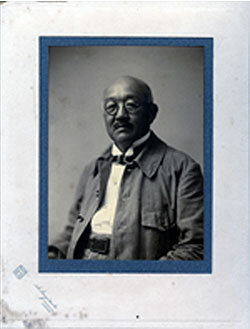 The results of his studies have been published in numerous books such as the Collection of Buddhist Statues（Gakuseisha）, which is a collection of photographs of Buddhist statues throughout Japan and the Study of the History of Japanese Buddhist Sculpture (Yoshikawa Kobunkan Inc.). Photographs connected with these publications amount to 6 filing cabinets with 4 drawers of B-4 size. Reports on his investigation exceed 300. These materials will be listed so that they may be made public. 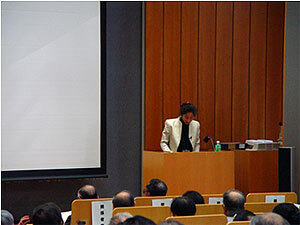 To commemorate the re-establishment of the Independent Administrative Institution, National Institute for Cultural Heritage in April 2007, the second special exhibit of works in the collection of the Kuroda Memorial Hall was held at the Heisei-kan of the Tokyo National Museum from Tuesday, November 6 to Sunday, December 2. 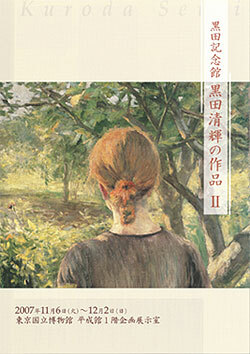 In this exhibit 22 works were exhibited, including those that Kuroda painted during his stay at Grez-sur-Loing, a farming village near Paris that he liked to visit when he was studying in France and 4 original illustrations, “Japanese Genre Scenes,” that were used for the essay “Femmes japonaises” written by Pierre Loti (1850 – 1923) in the October 1891 issue of Figaro Illustré. 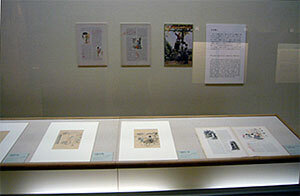 This is the first time for the October 1891 issue of Figaro Illustré and the “Japanese Genre Scenes” to be exhibited at the same time. It was a good opportunity to see concretely the image of Japan that Kuroda gave to the French society. Yamanashi also spoke about Kuroda Seiki, who was honored as the father of western paintings in modern Japan, and his works. 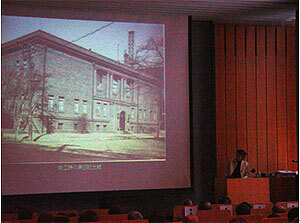 As a part of the activity to disseminate the results of art historical study, the Institute holds a public lecture once a year for two days in autumn. Until last year, this lecture was hosted by the Department of Fine Arts, but with the change in the structure of the institution, the Department of Research Programming is in charge from this year. 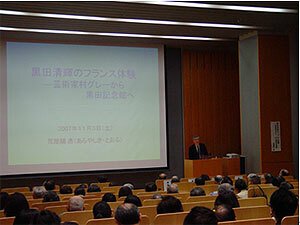 The 41st of the series of lectures was held on November 2 and 3. On Friday, November 2, Emura Tomoko and Nakabe Yoshitaka gave lectures on paintings of the pre-modern period, particularly on those of Rimpa School which are highly evaluated internationally. Emura in her “The Eyes and Hands of Korin” spoke about the expressions of Ogata Korin, focusing on his Flowering Plants of the Four Seasons (formerly in the Tsugaru Family collection, now in a private collection). Nakabe of The Museum Yamatobunkakan in his “Yashiro Yukio’s View on Rimpa School” spoke on the way works by artists of the Rimpa School were received and evaluated in the modern period by looking at this matter from the eyes of Yashiro Yukio, a researcher in the initial period of the study of art history in Japan. 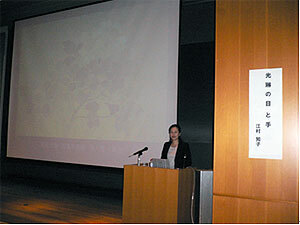 On Saturday, November 3, Yamanashi Emiko and Arayashiki Toru reported on the studies related to modern art and modern art history. Yamanashi in her “Yashiro Yukio and The Institute of Art Research” studied the ideal image, with concrete details, for The Institute of Art Research, the forerunner of the present Institute as conceived by Yashiro Yukio, who also became its first director when it was established in 1930. Arayashiki of Pola Museum of Art in his “Kuroda Seiki’s French Experience: From the Artists’ Village Grez-sur-Loing to Kuroda Memorial Hall” spoke in concrete terms about what Kuroda Seiki, the person who played an important role in the formation of the system of art in Japan and who was also a central figure in the establishment of The Institute of Art Research, gained through his experience during his study in France and particularly in his stay at Grez-sur-Loing outside Paris. It appears that interest in cultural properties is increasing year by year. 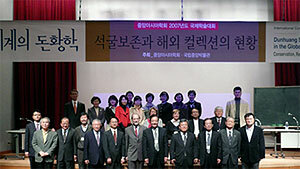 We hope to continue to develop the study of fine arts and to communicate to people the abundant world of art. The Department of Research Programming holds workshops on “the original” in preparation for the International Symposium on the Conservation and Restoration of Cultural Property which it will host next fiscal year. 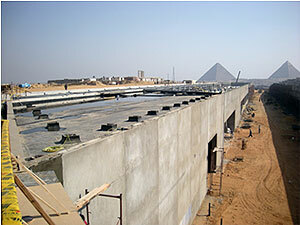 In the November workshop emphasis was placed on architecture. Inaba Nobuko and Shimizu Shin’ichi of the Japan Center for International Cooperation in Conservation joined the discussions, the former on the 14th and the latter on the 21st. Unlike paintings and sculptures which are carefully conserved indoors, buildings are exposed to the elements or are necessarily subjected to repeated repairs and renovations because they are used as residences and facilities. In addition to such characteristic of buildings, that they are subject to change, the differences in the materials employed, be it wood or stone, call for different maintenance methods. This in turn creates differences in the concept for their conservation among different cultures in which different materials are prevalent. The question as to which form of a building in which period of its history and using what type of materials is to be handed down – in other words, the question of authenticity, is a topic for endless discussion. In The Cooperative Program for the Conservation of Japanese Art Objects Overseas, Japanese paintings in overseas collections are temporarily brought back to Japan for conservation. Every year, persons in charge from the collections concerned come to Japan to confirm the progress of restoration work and to select new mounting materials. Of the five items being restored this fiscal year, staff from three of the collections concerned visited the restoration studios with the persons from the Department of Research Programming who are in charge of the respective paintings. The restoration of these paintings will be completed by the end of March 2008. After being shown to the Administrative Committee of the Program, they will be opened to the public at the Tokyo National Museum. The full-scale restoration of the Hikone Screen (collection of the Hikone Castle Museum), which took two years, was completed and the restored folding screen was exhibited to the public in a special exhibition held to commemorate the 40th anniversary of the construction of the castle. The Institute has held a joint investigation of the Hikone Screen with the Hikone Castle Museum from before the start of the restoration project. After the closing of the exhibition, photographs of the folding screen were taken and the condition of the surface that has been stabilized by restoration was investigated and documented by high-resolution digital images and near infrared images. A report on these results is in the final stage of editing for publication. New findings obtained through this investigation are expected to become valuable material not only for the study of the Hikone Screen but also for the study of the history of Japanese paintings as a whole. As part of the project entitled “Study of Conservation and Utilization of Intangible Cultural Properties,” the Department of Intangible Cultural Heritage conducted an interview, on November 12 at the dressing room of the National Bunraku Theatre (Osaka), of Tosha Shusaku and Mochizuki Tamekichi of the Mochizuki Tamekichi School that has been engaged in the performance of hayashi music for bunraku since 1963. Both gentlemen are veteran performers, Tosha Shusaku of the fue, mainly, and Mochizuki Tamekichi of instruments other than fue. They spoke about very interesting topics associated with hayashi music, a very important part of bunraku that supports it from behind the scenes and that has not been noted so much until now. These included the changes in hayashi music and matters related to the training the hayashi musicians undergo. We are grateful for their having spared the time in the midst of their busy schedule in order to speak to us. During the conservation missions by the National Research Institute for Cultural Properties, Tokyo, within the framework of UNESCO/Japanese Funds-in-Trust, hundreds of small fragments of bark Buddhist manuscripts were found in 2003 from caves in Bamiyan, Afghanistan. They are quite invaluable as important historical witnesses of the Buddhism that once flourished in Bamiyan. The fragments are mostly as small as a few centimetres in width and length. Many are folded, making the texts illegible and creating much difficulty for the viewers. In that sense, they are not in a form that would allow displaying them to the general public. 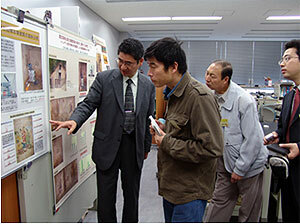 In November 2007, with the financial aid of the Sumitomo Foundation, 543 pieces (at initial counting) of the fragments of Bamiyan bark manuscripts were brought to Japan for conservation treatment. On this occasion, a local conservator from Kabul National Museum was also invited to the Institute, and arrived with the fragments, for conservation training. A number of fragments were safely flattened and mounted in special frames, and then returned to Afghanistan safely with the aid of the Embassy of Afghanistan in Japan. In cooperation with the Japan International Cooperation Agency (JICA), the Japan Center for International Cooperation in Conservation has been providing technical advice to the GEM-CC. In November and December, members of the Center visited the GEM-CC to discuss future strategies for the project. 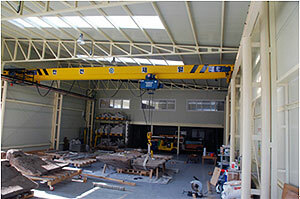 For the time being, the Center is providing necessary technical and machinery support prior to the grand opening of the GEM-CC (April 2008) after which time it will hold some training activities, such as workshops on particular subjects in conservation. 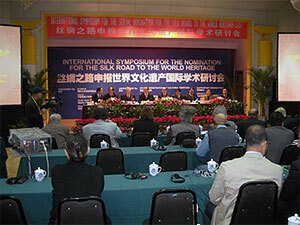 On 30 and 31 October, 2007, an international symposium was organized by ICOMOS, UNESCO, Shaanxi Municipal People’s Government and Xi’an Municipal People’s Government. It aimed to introduce the cultural nature of the Silk Roads and to supply instruction and technical consultation for nomination of the Silk Roads to the World Heritage. The east end of this vast area targeted for this nomination was considered as Xi’an at this point; unfortunately, Nara was excluded from this Silk Roads in the nomination. From the side of Japan, it is considered quite essential to keep discussing, in the nomination process, the geographical and historical definitions of the Silk Roads. In the capacity building program held at the China National Institute of Cultural Property in Beijing, the participants began to attend classes on practical training from November. They studied under the guidance of Japanese and Chinese experts. Classes on the methods of conservation and storage of documents using recently developed neutral paper were quite unexpected but interesting for students who had expected a more restoration oriented training. 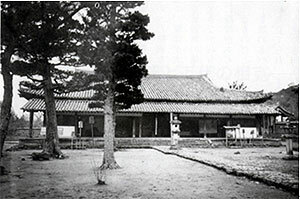 Since there is some difference in the traditional restoration techniques of Japan and China, Japanese experts are continually faced with the question of how they can contribute to the conservation of “Chinese paper cultural properties.” However, rather than merely giving guidance to students, promotion of exchange of techniques between experts of the two countries is expected through such efforts.